FIFA Futsal Instructor Juliano Schmeling leads a practical session. 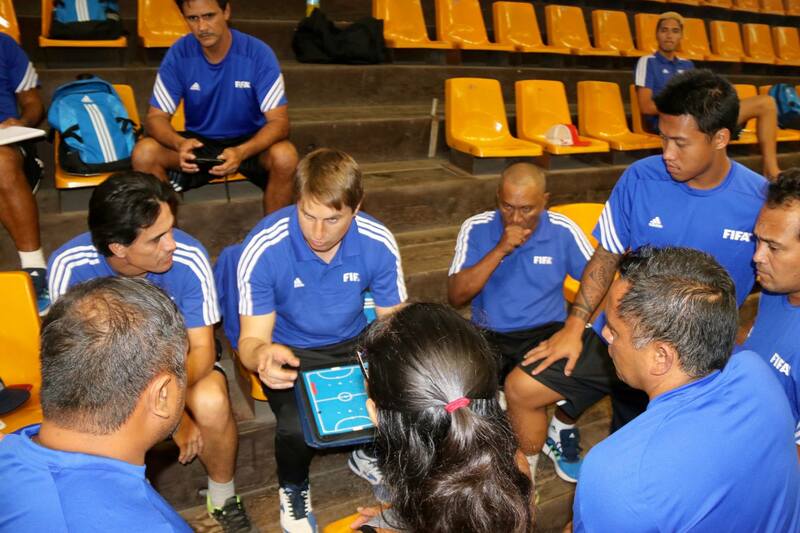 Futsal development was given a boost last week when the FIFA Futsal Coaching Course rolled into town with Oceania-based FIFA Futsal Instructor, Brazilian Juliano Schmeling, leading 16 coaches through their paces. The participants attended from all across French Polynesia with representatives from Taha’a, Raiatea, Bora Bora, Tubuai, Raivavae and Nuku Hiva hanging on Schmeling’s every word with futsal a hugely popular discipline throughout the nation. Born in Brazil, Schmeling moved to New Zealand in 2011 and began developing futsal, with the ultimate goal of being involved in the game’s development in the Pacific. Over seven years he has spend time in New Zealand, Australia and the Solomon Islands which has helped him to realise that goal. “In 2014 I was nominated to become a FIFA Futsal Instructor and I started with courses in Papua New Guinea, Vanuatu, Samoa, New Caledonia and now, Tahiti,” Schmeling said. Arriving in Tahiti to deliver this latest FIFA course, Schmeling said the objective was to focus on coaches specifically with a variety of areas being focused on including improving the practice of coaching, sharing as much knowledge and offering tools for improvement and uniting the participants in terms of their objectives and a common plan. Schmeling admitted it was an ambitious list of objectives for a one week course. “Of course it’s pretty ambitious for one week but I have the impression that we’ve made some advances,” he noted. As for the level of the coaches in Tahiti, the Brazilian was pleasantly surprised. “I have a pretty good idea of the level in the countries in the South Pacific. I was pleasantly surprised by the level of motivation and the openness of the coaches which I’ve worked with this week. During the practical coaching sessions Schmeling was able to see some of the local talent in action and said he could see noticeable improvement in the Polynesian players. “Physically and mentally they’re very strong and they are incredibly disciplined,” he said. “Those are essential values for development in this sport. I think also that one of the keys to long-term development in this discipline is to have good infrastructure. Having been part of a local campaign to qualify for a FIFA Futsal World Cup with Solomon Islands, Schmeling has intimate knowledge of how that can help bolster the growth of the game. And he hopes that Tahiti can turn their passion for futsal into results. “I really hope to see Tahiti qualify in 2019 and I encourage everyone to work hard from today onward around a solid and ambitious preparation plan.